Quitting any kind of job can be stressful, but sometimes people want to quit their job and feel better about themselves. Especially, when it is such kind of job where the employer or the company is not valuing the efforts of the candidate or the employee. At the end that employee might decide to quit their job, but not to quit so easily. And finally, they might decide on getting a dramatic exit with style. Moreover, to do you need a plan to quit your job in completely open and stylish manner. Making a scene and creating a dramatic entrance or exit needs a plan. Similarly, when you wish to quit your job in a stylish manner, then you should follow certain ways to accomplish your stylish exit from the company. There are 3 different types of scenario’s where a person can quit their job. Firstly, they can choose to resign from job, or can get themselves fired, which is not a great idea to pursue and last but not the least one can take a laid off from their job. This is one of the greatest advice that one can receive if they really want to make their exit in a complete stylish and dramatic manner. So taking a laid off opportunity can help them with it, because in that way they can quit the job and even be offered of additional benefits from the company. Sometimes quitting a job can make things worse for the employee if he is thinking of quitting with style. So it is always better to check for the right time before making a great exit from the company. The most often mistake people conduct while quitting a job is that they choose a wrong time to quit the job, and which can ultimately make things worse for them and for their reputation. Therefore, it is always better for a person that they have to wait for the right time before making a styling exit from the company. Some people believe in keeping things as secret, but when it comes to quitting the job, then they should consider making an announcement before surprising people at one’s workplace. So it is better to announce or sharing one’s quitting decision well in advance, by that the situation can be handled well in advance. Therefore, the employee who is quitting the job and wants to make his exit in a most dramatic way should make others prepare, with their stylish exit. Sometimes people forget to spend time with their closed one’s before leaving anywhere. Therefore, people need to make a habit of spending time with their loved one’s so that they regret their negligence later on in their life. Similarly, when it comes to quitting a job, then they need to share their working experience with their colleagues to cherish it for the rest of their life. Moreover, when they celebrate their resignation, then they should share their time with their loved ones in their workplace. It is something fun that anyone can do for themselves. Moreover, it is one of the fun and stylish ways to quit your job. And people does unless they are the most admired and loved one’s in the company. Therefore, it is better for everyone to understand that most of the people don’t get a chance to conduct a farewell party so that they can get out their job in a more stylish manner. So conducting a farewell party can be considered as the best way to quit your job stylishly. It is one of the common ways of quitting a job, but when it comes to quitting a job in style, then the employee must consider writing a notice letter about their resignation. This is considered as a best way to resign. Moreover, writing a resignation letter is for the sake of the company and it definitely provides an notice period for the company within which the employer can replace leaving employee with someone to avoid loss of the company time and wealth. Sometimes people take advantage of an exit interview to express their feeling about the company and their employer. But the truth is that while attending an exit interview, the ex employee must control his emotions and finish off his exit interview in a professional manner so that in future if any HR enquires about the candidates personal qualities, then the ex HR need to explain them all the positive qualities. Therefore, it is always better to keep their negative experience with their friends. Some people believe in composing an Email to all of their colleagues to let them know how the person always felt about working with them. But if the person leaving the company is not so popular, then he should think of sending that Email to a limited people in his group to send them a message. Therefore, while sending that Email the person can write sarcastic jokes to make it cool with everybody. It is one of the stylish way to choose, if someone is thinking of quitting their job. On the contrary, to the above statement some people would think of making it real personal and fun. And ultimately they decide to write a handwritten note to their colleagues which is one of the gesture to show all his colleagues that it was fun to work with them. Moreover, sending a hand written letter can make them feel even special to be part of one’s professional life. Therefore, writing a hand written notes can make things real stylish for the person before quitting the job or the company. There are people who do some crazy things before quitting a job, which makes others feel entertained. Some crazy stuff like dancing before leaving, singing to the boss and many more which anyone won’t even imagine to do while quitting their job. This can sound crazy, but it is one of the fun ways to quit their job unexpectedly. Some people think of singing just to embarrass their boss, but some people genuinely write a poem for the sake of their boss. Therefore, singing a song or writing a poem along with singing it in front of the boss can make things fun for that particular employee. And eventually if the boss takes it personally, then he might get embarrassed of all the drama. It is one of the classic way of making an exit form the company. Some people prepare a power point presentation about their working experience in that company which makes it more professional, but it is always better to create a video or a short movie which can explain all the things that person felt while working in the company. Therefore, surprising the boss with this emotional video or movie can get that person a stylish exit from the company. It is one of the gesture if the employee wants his boss to notice his resignation letter clearly. Sending a cake with a dressing of resignation on it makes things more creative, but some can even make peace with their boss and send them the resignation letter separately with the cake. Therefore, it is completely two different ways of sending a resignation letter with a cake, but clearly it is one of the positively accepted resignation proposal ever. It is a weird way of notifying a boss about one’s resignation, but some people follow such weird steps. So a person can think of arranging a most happening party and invite everyone of the colleagues to the party, including the boss and as a show stopper the person can deliver his resignation letter to his boss and try to capture his expression in a most uncommon way. Therefore, before making such move the person should be aware of his bosses powers, once he take things in his hands. 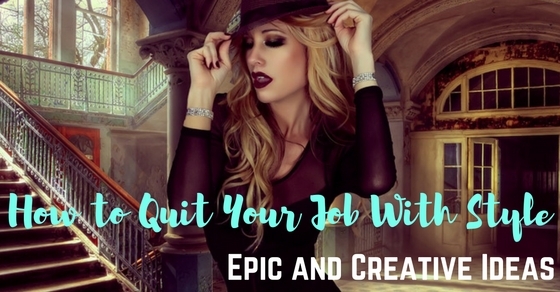 Finally, the bottom line is that at the end of this discussion regarding the craziest and fun ways which you can choose as a manner for their stylish proposal to quit your job can create some sort confusion among all the readers. But these ways are only for those who wants to make themselves and other entertain with their acts. Or else if you really wants to quit your job, then they can think of following all the above ways mentioned up front of the discussion to make a professional but stylish exit.